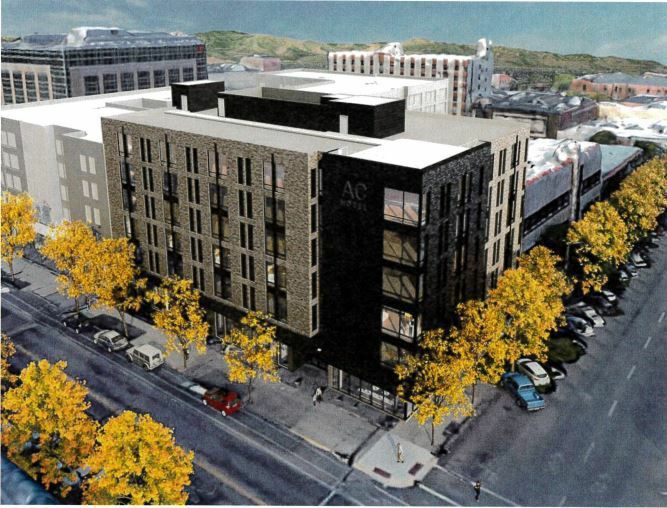 An architectural rendering of what the proposed AC Hotel in downtown Missoula would look like. The same developer who built the new Mercantile hotel downtown is planning another $20.6-million, six-story hotel next door with a rooftop bar and basement restaurant. Andy Holloran and a group of investors are going to ask the Missoula Redevelopment Agency for roughly $1.9 million in Tax Increment Financing (TIF) to deconstruct the old Firestone building at 175 Pattee Street, salvage its materials for reuse, relocate utilities and improve the public right-of-way. The money would be paid back by the new property taxes generated by the new hotel, estimated to be $186,000 per year more than what the site is now generating. The debt service on bonds used to pay for the TIF assistance would also be paid back by the taxes on other new projects in the booming Front Street Urban Renewal District (URD). Ellen Buchanan, the director of the Missoula Redevelopment Agency, said in a memo to the MRA’s board that the project will revitalize a blighted old building that has been subject to vandalism for years. 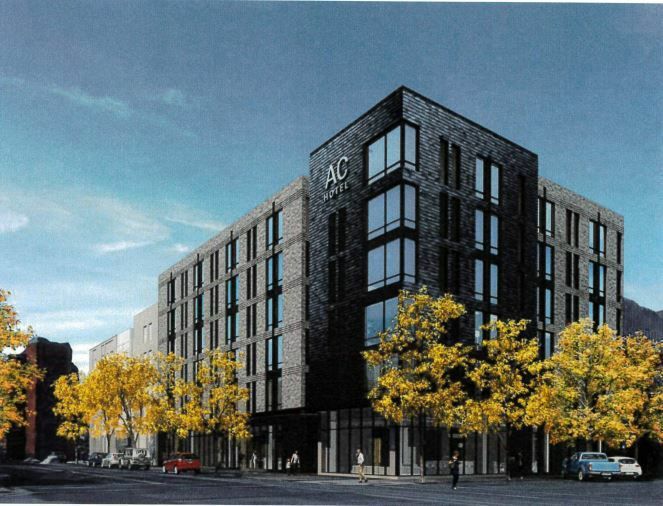 She noted that the entire downtown will benefit from visitor spending, an argument she made when recommending the MRA board approve the Mercantile Hotel with $3.59 million in TIF assistance. “When the money being spent in the community just for operation of the hotel for food, beverages, supplies, and miscellaneous expenses are considered, the impact of a hotel is significant even beyond the spending by guests in the downtown and surrounding area," she said. The hotel is expected to be complete in late 2020, and construction is underway in shoring up the basement area right now. The hotel will be called the AC by Marriott, and will consist of 70,250 square feet and 105 guest rooms. The rooftop will have an outdoor terrace with a seasonal/temporary canopy covering seating, fire pits and a bar. The ground floor will consist of the hotel lobby, offices, a breakfast bar, a kitchen, a fitness room and meeting space. The space for the basement “speakeasy-style” restaurant will be accessed by the alley. The five-story Mercantile hotel has 175 rooms. Buchanan noted that the Firestone building has been “basically vacant” since the beginning of the century, although it has been briefly used by a scattering of businesses and currently houses the Mercantile hotel’s construction office. There has been a lot of development and interest in that corner, including plans by a group of Bozeman developers to turn the old yellow-colored hotel on the southeast corner into a new project. Buchanan said that the TIF amount requested means the ratio of public to private investment is one-to-nine, which she said is the range the MRA aspires to achieve. “As the board is aware, there is very limited revenue in the Front Street URD in this current fiscal year,” she said. “(MRA) staff has calculated what we believe to be a very conservative revenue projection for the new hotel and are confident that there will be adequate increment from this project alone to cover the debt service on a bond issue estimated at just under $2 million." Additionally, she said, the estimated TIF revenue from the Mercantile Residence Inn should produce a surplus in excess of $180,000 after debt service. "This is based on a number that does not include final tenant finishes or personal property," Buchanan said. When the hotel is finished, Buchanan said the Front Street Urban Renewal District will be seeing the full property tax value from the new Mercantile Residence Inn, the ROAM Student Housing and the luxury Levasseur Street Townhomes nearby. “By the time that the bonds (for the AC Hotel) are sold, projected revenues in the Front Street URD will exceed debt service requirements by a significant amount,” she said. At the MRA’s annual update to the City Council earlier this month, council member Jesse Ramos said he didn’t think property owners in URDs in Missoula would like it if they knew new property taxes in those districts are being diverted away from the city’s general fund, police, firefighters and schools. "So we have to make up for that by raising taxes on everybody else," he said. "And according to Montana law, the only thing that TIF money is supposed to be used for is the elimination of blight." Buchanan, however, has strongly defended TIF, saying it’s an economic development tool that spurs more investment in blighted areas than would occur otherwise and increases the city’s tax revenue in the long term. The Front Street Urban Renewal District was formed in 2007 and will sunset in 2044 unless additional bonds are sold. It has grown in value from producing $1.4 million in tax revenue when it was created to $1.9 million every year now. Buchanan told a Citizens Academy meeting earlier this year that Missoula's downtown was a deteriorating, crime-ridden area before TIF dollars revitalized the area. The MRA board meets Thursday to discuss the request.